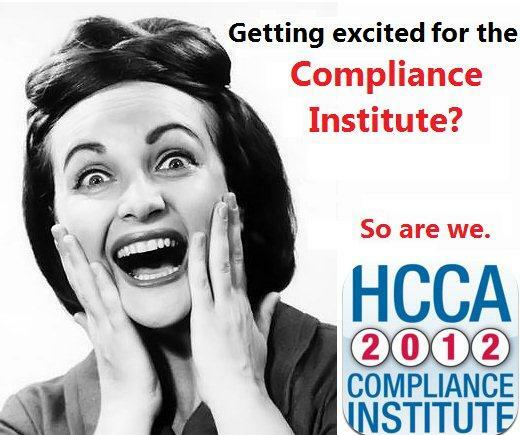 HCCA is Excited for the Upcoming Compliance Institute and so is Pinnacle Healthcare Consulting! HCCA is excited for the upcoming Compliance Institute and so is Pinnacle Healthcare Consulting and the Physician FMV Team! Come visit us at booth 511 to learn more about our services and enter to win either a free Physician FMV License or the award winning Nook Color! Get a Head Start on Compliance With our Fair Market Value Checklist & Risk Assessment for Physician Contracts Tool! With over 200 hospitals and health systems – and growing, the Physician FMV Program strives to create innovative and beneficial services for our licensed Program members. The Physician Fair Market Value Program pays close attention to our clients’ ever-growing needs for an expansive list of physician specialties. Physician specialties new this year include: Anatomic Pathology Specialty, Bariatric Surgery Specialty, Breast Surgery Specialty, Clinical Pathology Specialty, Hospice & Palliative Care Specialty, Nurse Practitioner (General) Specialty, Pediatric (Otolaryngology) Specialty, Surgical Podiatry Specialty and Thoracic Surgery Specialty. If your organization requires a specific physician specialty that is not currently listed, please contact a Physician FMV Program team member, who can help you find the information you need. The Physician FMV Program is a proven solution for supporting “in-the-box” arrangements. However, when faced with compensating highly productive physicians, contracting with Key Opinion Leaders, and working with extraordinary recruitment / retention challenges, hospitals / health systems may need to pay “above the Workbook Program” range to secure physician services. As reference, Physician FMV Online now provides 90th percentile reference information for employed physician compensation. Although Pinnacle’s third party FMV opinion does not extend beyond the 75th percentile, Physician FMV’s goal is to provide client members with flexibility through data-driven resources. 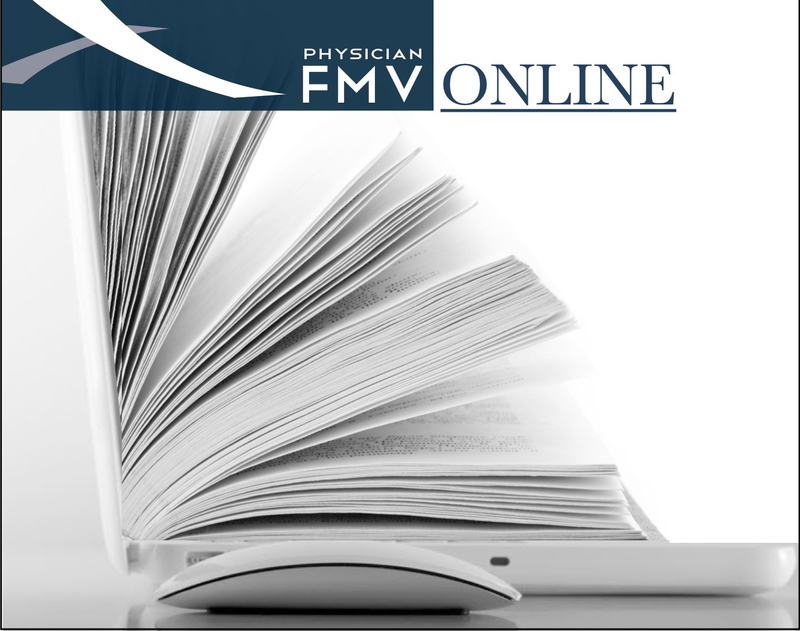 Physician FMV Online introduces our new Blended Call Arrangement Estimator. This tool is intended to assist hospitals with an estimate of reasonable daily compensation for blended call coverage arrangements (those arrangements that combine restricted / in-house call with unrestricted / beeper call). The calculation derived by this model proportionally combines FMV Hourly Compensation data for restricted time with the Unrestricted Call data for unrestricted time. The calculation provides a useful starting point to evaluate FMV compensation for more complex call arrangements. Physician compensation and benchmarking models continue to rely on productivity metrics, especially physician work relative value units (WRVUs). Contract negotiations, incentive plans and the success of physician compensation strategies often hinge on WRVU measurements. Payor mix issues can be mitigated through the utilization of WRVUs to balance individual physician production and declining unfavorable reimbursement levels. With survey sources now providing more robust compensation to WRVU data, the Physician FMV Program is making compensation to WRVU data by specialty available for reference. Be sure to stop by and visit Pinnacle Healthcare Consulting at our exhibit booth! This year’s Annual Conference focuses on the changes taking place in healthcare. Speakers will address such issues as Leadership, Healthcare Reform, Revenue Cycle, and Accounting. Last but not least, an interactive Point/Counter Point discussion on Healthcare Reform from both political sides of the issue should generate some lively discussion. Certification Coaching Course- Registration details on Program. This course is designed to help you in taking the HFMA Certification Exam as well as the self-study materials you need to purchase in advance of the course. Rulon Stacy has been CEO of Poudre Valley Health System since 1996 and has led the transformation of PVHS into a health system with more than 5,300 employees and a dozen facilities in three states. He has found ways to align incentives with regional providers in order to maximize value to patients, developed nearly 20 joint ventures which focus on quality outcomes and in the process quadrupled the net revenue and net assets of the health system. He will share how this has been accomplished along with the leadership skills he used to make it happen. Rulon has received numerous awards including the Young Healthcare Executive of the Year from the American College of Healthcare Administrators (ACHE) and the 100 Most Influential People in Healthcare by Modern Healthcare. He served on the governing board of ACHE and was the 77th Chairman of their board. In 2008, PVHS was recognized by the President of the United States as the only health system in the United States to receive the Malcolm Baldrige National Quality Award. You will want to hear his message on how he has led this organization to excellence and what you need to do to lead your organization in these challenging times. HCAHPS along with the more sophisticated and demanding patient/consumer require that financial executives and revenue cycle professionals protect the lifetime revenue value of each patient served. But, a mere “patient-focused” approach is no longer enough. Quality clinical experiences must be enhanced by truly exceptional revenue cycle touch point outcomes – from pre-access through account closure. Therefore, the organizational culture and process, technology and people models must be fully transformed. An essential strategy of all other industries except healthcare… Customer Relationship Management (CRM)… is the key.  – Identify and eliminate avoidable revenue cycle processing costs; secure future patient lifetime revenues by crafting a CRM-based, patient-preference driven, and clinically integrated revenue cycle process, technology, and people model; and prepare for successful implementation by identifying and mitigating cultural and other organizational risks. What have been impacts of PPACA to date? What challenges are ahead of us?  – Accountable Care Organizations (ACOs): will they save money, what unintended consequences are there? – How is Kaiser Permanente dealing with these challenges; what about other health plans? The regulatory and competitive landscape is changing rapidly for health care insurers. These changes will result in new product designs and new reimbursement strategies that will impact providers. Hear the inside story from a health insurance company perspective. This session will review the current status of credit markets for various healthcare borrowers. Included will be a historical perspective on interest rate trends, rating agency viewpoints and concerns, general economic and healthcare specific statistics and outlooks for capital access. Participants will learn the current state of credit markets, future concerns that may affect the cost of capital and what can be done to best position their respective organizations in the event accessing capital is needed within the next year or two. An overview of the 2012 Medicare Part A updates and changes will be provided along with an overview of Partners in Compliance that includes Recovery Audit Contractor (RAC) Program. · Mike Yont, Managing Principal, Integral Healthcare Solutions, Inc.
· Terri Boettcher, Vice President Collections, BC Services, Inc.
Bruce Schroffel, newly appointed president of University of Colorado Health, will review the transitions the industry is going through and discuss in detail the rational that drove him to form a new partnership with Poudre Valley Health System. He’ll explain the long-term lease with Memorial Health System. He will also state why he thinks this new model of bringing together the best in academic medicine with the best in community will not only work, but thrive in a chaotic industry. The two experts will provide their insights from the left and right of the political spectrum on the healthcare reform law. Each of them will give a presentation and then take questions from each other and the audience. This won’t be a review of the ethics code, case studies, or case law! Instead, it will be a unique program designed to help assure that you and your entire organization are able to more easily “walk the talk” of great ethics. This oftenhumorous program will show us ethics risks we never even knew we had and what can be done right now to make sure those risks don’t turn into costly ethical and legal problems on the job. You will also learn how even a slightly changed focus on ethics can significantly build your organization’s bottom line. Ethics and fun aren’t words you normally hear in the same sentence. However, Dr. Christopher Bauer has been making professional ethics both straightforward and fun for international audiences for more than 25 years. He will present ethics differently than you have probably ever experienced them before. The tone will be conversational and the ideas immediately applicable. You will leave with easy, practical ideas and tools to reduce your risk for ethics difficulties while simultaneously reducing the risk of your colleagues, coworkers and entire organizations. Pinnacle Healthcare Consulting was excited to sponsor Fort Collins Area Chamber of Commerce yesterday at the Health Care in Your Future Summit. Over 280 people were in attendance to discuss developments in health care, the outlook for the health care industry in the Fort Collins region and actions that could strengthen the health care sector. Where You Stand on Health Care Reform Depends on Where You Sit: What Does All This Change Mean to Me? All This Reform Stuff Sounds Expensive: Who Pays? 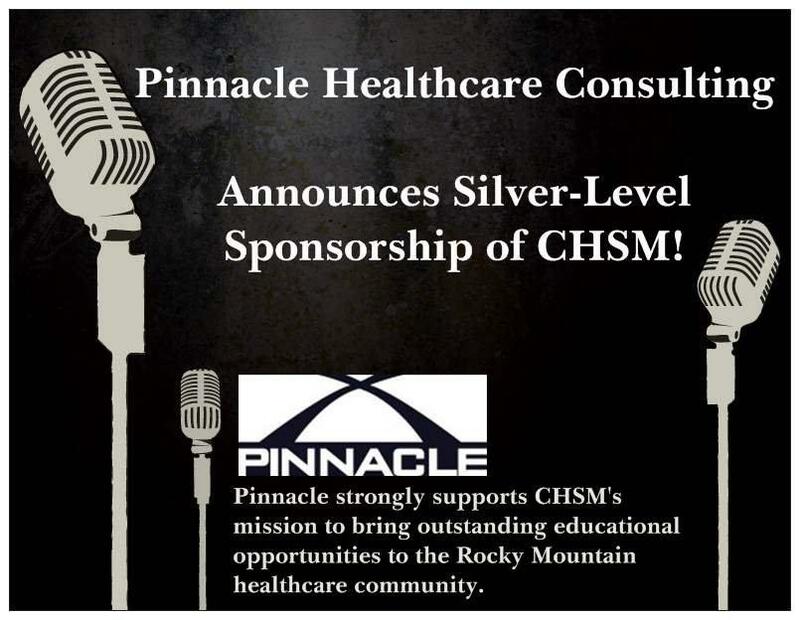 Join Pinnacle Healthcare Consulting at CHSM’s Upcoming Event! The Patient Protection and Affordable Care Act (PPACA) authorized states to set up health benefit exchanges to enable individuals and small businesses to purchase health insurance coverage by 2014. Colorado is leading the way in setting up this new marketplace, providing purchasers with quality choices, comparative information about plans and tax credits, consumer protections, and more control. 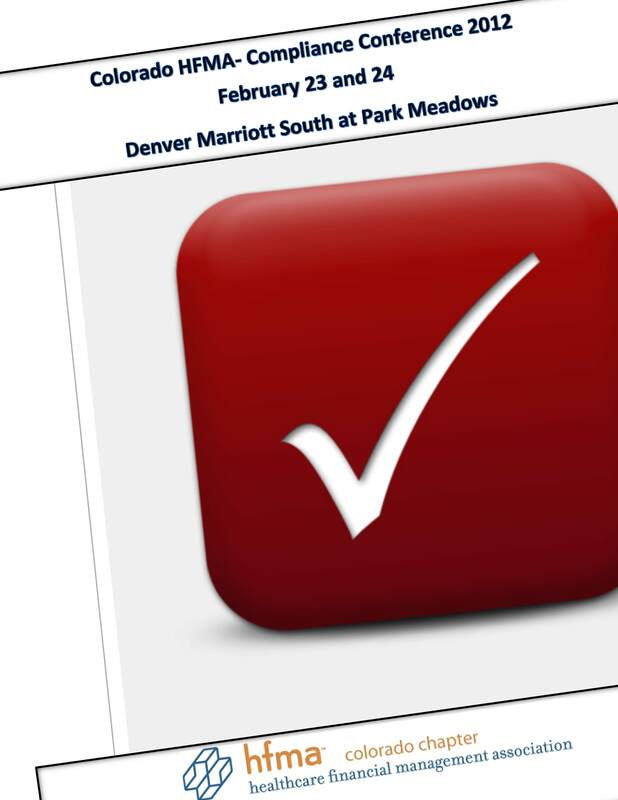 Regardless of the outcomes of pending court cases challenging PPACA’s individual mandate, Colorado has chosen to move ahead with what could become a new national model. Patty Fontneau, the Executive Director and CEO of the new Colorado Health Benefit Exchange (COHBE), will be our featured speaker. This promises to be a “must attend” event! Pre Registration Register by March 2, 2012 to save $10. 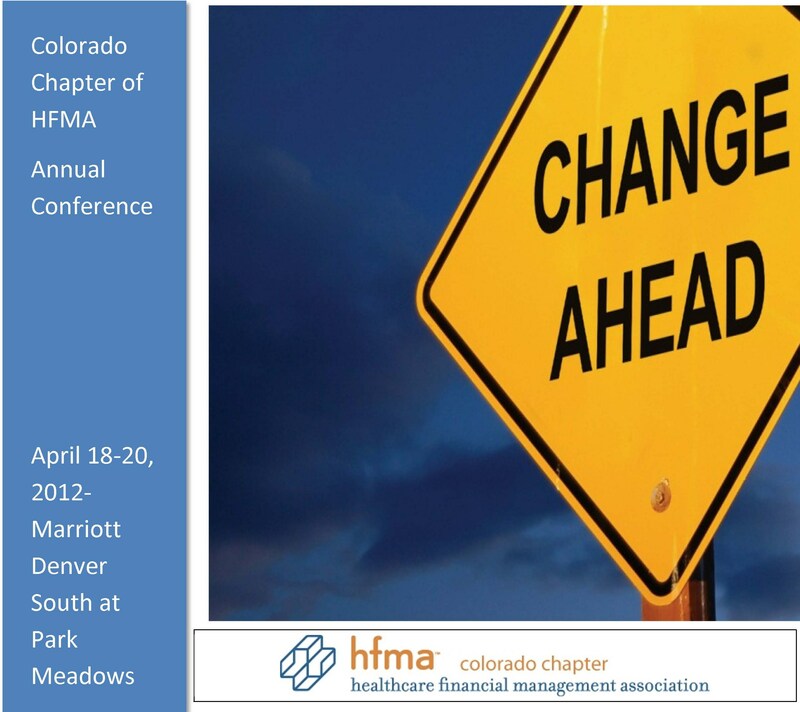 About Our Speaker Patty Fontneau, MBA, is Executive Director and CEO, Colorado Health Benefit Exchange (COHBE). Previously, Ms. Fontneau served as COO at Holme Roberts & Owen LLP. She also served as CAO for The IMA Financial Group Inc. and as VP and General Manager of the Western Service Center of TIAA-CREF, managing the operation of a 1,300-employee office in Denver. Patty serves on the boards of CollegeInvest, the Auraria Foundation, the Downtown Denver Partnership and other organizations. She won the 2007 Outstanding Women in Business Award (banking and finance category) from the Denver Business Journal, and the Leadership Award from the Alumni Association of the University of Colorado at Denver Business School. With an aging and increasingly sick patient population triggering skyrocketing healthcare costs and changes to delivery and reimbursement systems, the future of the healthcare industry is as complicated as ever. Please join Husch Blackwell, Pinnacle Healthcare Consulting and guest speaker Ford Koles, Executive Director of The Advisory Board Company, for a half-day seminar discussing strategies for mapping out a plan for your healthcare organization’s future. The program is complimentary; however, registration is required. Please reply to Shana Hoy at 816.983.8809 by April 5, 2012. Husch Blackwell LLP is a full-service litigation and business law firm with 600 attorneys in locations across the United States and in London, serving clients with domestic and international operations. The United States consumes more healthcare than any other country in the world while individuals, governments and employers struggle to pay the bill. The U.S. recession has exacerbated the problem for providers and payers alike. With an industry wide focus on increasing quality and decreasing costs, providers must implement innovative value based strategies to survive and thrive in the “new normal” for U.S. healthcare. As the one year anniversary of the passage of historic healthcare reform legislation has come and gone, many believe that the healthcare financing system remains unsustainable as the “Snark” continues to elude capture or even definition. In addition to providing an understanding of the current state of U.S. healthcare economics and insights into the inevitable changes that will be required over the coming years for providers to survive and prosper under reform, this presentation focuses on current and historical attempts in the healthcare industry to identify, increase, and communicate value to patients, providers, employers. As healthcare providers shift from volume based to value based strategies, key healthcare megatrends will also be identified. The presenter’s views on the “winners and losers” under the “new normal” will also be discussed, providing insights about what the future U.S. healthcare system may eventually look like. 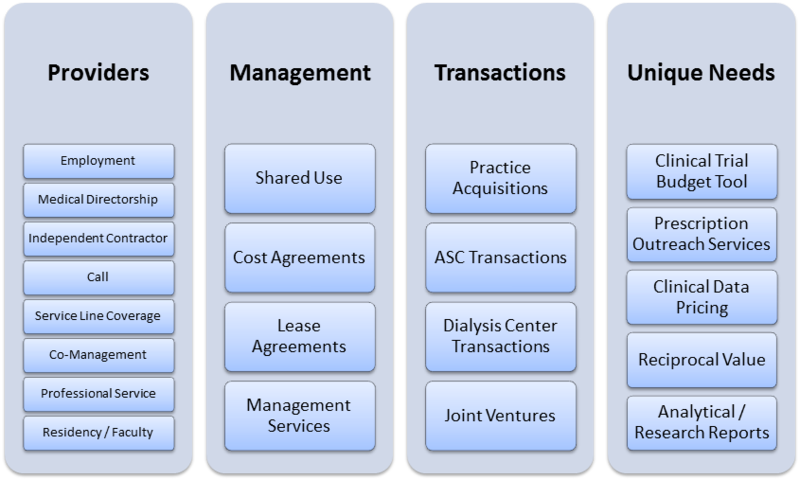 So You Have An EHR… But Are You Operationally Ready for Meaningful Use? Now that you have an EHR, do you know who is responsible for what is documented in your patient’s chart? Can your nurse enter that medication? What about the surgery consent forms? How does information entered in the EHR affect your liability and ability to meet Meaningful Use requirements? 1. Who must assume ultimate responsibility for the patient’s medical record in a multi-practice, integrated electronic health record? 2. How will P&P be set up to ensure people are collecting and inputting the clinical information needed to meet Meaningful Use criteria? 3. How are the CMO and others in a leadership position monitoring the timely completion of provider documentation while ensuring that the appropriate items are captured discretely in the electronic chart? This interactive presentation will focus on compliance considerations for both physicians and hospitals/health systems related to several types of collaborative ventures and new federal rules prompted by accountable care organizations and other reform developments. Practical advice on avoiding pitfalls and achieving a level of integration that will lead to a successful physician-hospital relationship will be covered. Just when you think you’ve done all the government audit preparation you can, they change the game and add more issues. This session will provide information on how to stay ahead of the game by developing a proactive, well-managed auditing program and response plan for government audits and auditors. A useful tool for identifying high risk areas and ideas for audit-related communication, training/education and governance will be provided. Elements of the Federal Sentencing Guidelines for Compliance Programs will also be discussed. • Recent sales and use tax audits conducted by the Colorado Department of Revenue and issues related to appeals. • Compliance aspect of sales and use tax as well as HIPAA concerns related to such audits. deadlines along with an overview of the tax exempt property laws in Colorado. 3. Examples of an actual sales and use tax audit and appeal issues. What would you do if an identity theft was perpetrated against some of your organization’s patients? Hear three compliance officers discuss how they addressed this nightmare. 4. How identity theft cases work their way through the legal and regulatory system. This operational focused session will provide national updates on government audits with audit findings and better practice ideas to reduce vulnerabilities. • Threats and vulnerabilities of mobile devices and apps. • ePHI and compliance risk implications. Speaker: Rich Cohan, MBA, FACHE, CHC, CCEP, System Director, Integrity, Compliance and Privacy. This will be an interactive session using several complex privacy case studies to determine what approach an organization might use in analyzing the facts when all of the facts might not be known or might be a bit unclear. How to respond to an incident will also be explored. • Responding to a breach in a way that promotes calm and increases support for a privacy program. 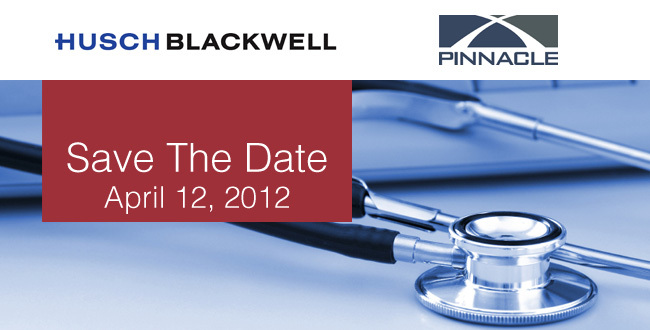 Join Pinnacle Healthcare Consulting at the upcoming American Health Lawyers Association (AHLA) Physicians and Physician Organizations Law Institute and Hospitals and Health Systems Law Institute: February 8-10, 2012 at the Lowes Portofino Bay Hotel in Orlando, FL! HORNE LLP has provided sponsorship in support of this program. The program will also include the Top Legal Developments for Hospitals and Physicians with Jack Schroder and Cindy Wisner. Attendees can register for just one of the programs or add-on the Hospitals and Health Systems Law Institute and attend three days of programming (February 8-10). The Physicians and Hospitals Law Institutes provide in-house and outside counsel with the latest information needed to advise clients in these two segments of the healthcare industry. The programs are scheduled so that you can attend either the Physicians program or the Hospitals program if your practice focuses on a particular provider or you can register for both for a more comprehensive curriculum that will prepare you to address legal issues facing both segments and gain a better understanding of their distinct legal challenges. All materials will be available on a website prior to the program and handed out on CD at the program. For those who still do want the binder they will be available for an additional fee; please order on the registration form. This program will be worth approximately 13.0 credits (including 1.0 ethics credit) for 60-minute states and approximately 15.6 credits (including 1.2 ethics credit) for 50-minute states. Participants will be given CLE Request forms at the program. Forms must be completed and returned to AHLA staff to receive credit. The sessions, unless otherwise designated, are intermediate to advanced in level. There are no prerequisites required to register for this program. This seminar will be worth approximately 15.0 CPE credits. AHLA is registered with the National Association of State Boards of Accountancy (NASBA) as a sponsor of continuing professional education on the National Registry of CPE Sponsors. State boards of accountancy have final authority on the acceptance of individual courses for CPE credit. Complaints regarding registered sponsors may be addressed to the National Registry of CPE Sponsors, 150 Fourth Avenue North, Suite 700, Nashville, TN 37219-2417. NASBA’s web site is located at http://www.nasba.org. This program is designed to be an update on developments in the area of physicians and physician organizations. There are no prerequisites or advanced preparations required to register for this group live program. Those seeking accounting credits should be familiar with the basic concepts of law and terminology associated with this area in order to obtain the full educational benefit of this program. Hotel accommodations are not included in the registration fee. When making reservations, please indicate that you are with the American Health Lawyers Association; the room block may sell out prior to hotel cut-off date. 5% off applicable classes of service for tickets purchased more than 30 days prior to the meeting. Restrictions apply and not all classes of service apply for the 5% discount. (United Airlines, American Airlines). Some restrictions may apply. Discounts apply between February 5-13. *Service fees apply to ticketed reservations. You may also call your own agency or the vendors directly and refer to the ID numbers. Cancellations must be received in writing by February 1, 2012. Refunds will not be issued for cancellations received after the cut-off date. Registration fee, minus the $125 administrative fee, will be refunded approximately 3-4 weeks following the program. If you wish to send a substitute, need more information regarding refund, complaint and program cancellation policies please call (202) 833-1100 prompt #5. Note that the registration fee is based on the AHLA membership status of the individual who actually attends the program. 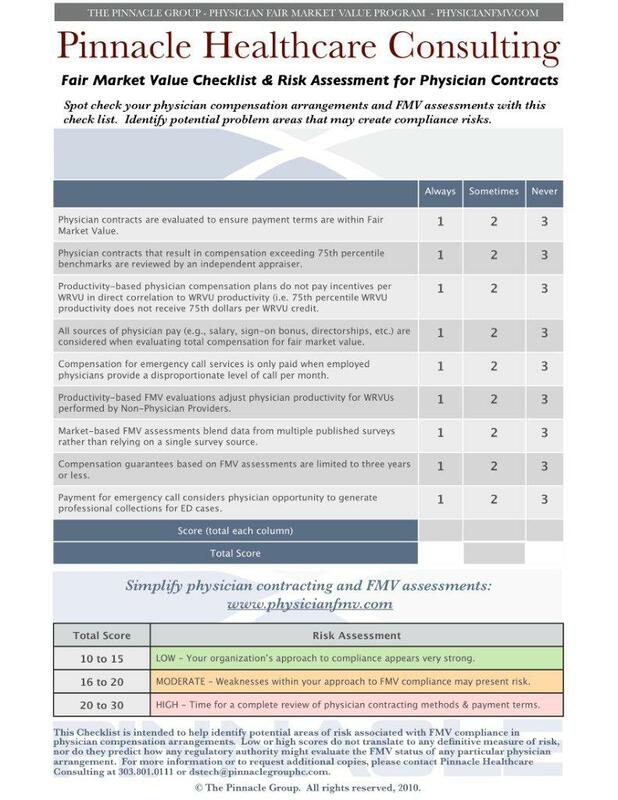 Determining appropriate and compliant physician fair market value (FMV) is complicated. Diverse factors like the Stark Law and inconsistent internal payment policies make it difficult to confidently approach physician compensation negotiations. Until now. As we begin a new year, the Business Valuation experts at Pinnacle Healthcare Consulting would like to take this opportunity to thank our friends, colleagues and business partners for a fun and successful 2011! Featured below are some examples of Pinnacle’s most unique, complex, and creative business valuation solutions of 2011. These case studies represent how we continue to assist clients meet their most challenging needs and reduce compliance risk. We look forward to the opportunity to work with your organization in 2012! Please visit: www.PinnacleGroupHC.com or contact Pinnacle Healthcare Consulting for any of your business valuation needs: kberkey@pinnaclegrouphc.com or (303) 801-0123. Pinnacle Healthcare Consulting performs FMV reviews of over 300 physician service arrangements per year for clients that range from large, multi-state health systems to independent physician practices. Our extensive database of hospital-physician relationships can be quickly tapped to evaluate a range of client transaction needs, speeding up the physician contracting process and eliminating unnecessary compliance costs. 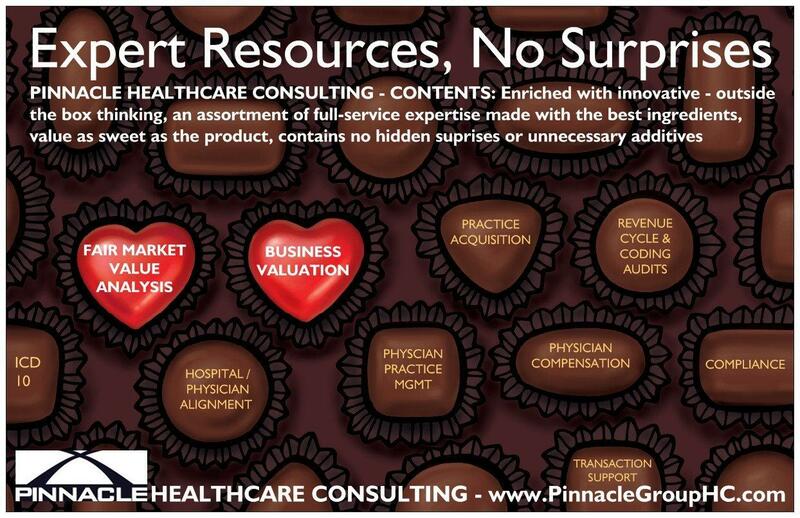 Pinnacle provides a potent combination of in-depth healthcare industry knowledge with a strong understanding of the nuances and best practices surrounding fair value in a GAAP reporting environment, including purchase price allocations, intangible asset and goodwill impairment testing, not-for-profit entities, and other assets, liabilities and equity securities. Stark Law and Anti-kickback compliance are some of the most challenging issues in physician compensation today. Pinnacle Healthcare Consulting can conduct a full audit of your billing and compensation process to determine the effectiveness of your Medicare and IRS compliance efforts. We are adept at working with counsel and financial managers to identify problem areas and create compliant billing, compensation and compliance solutions. Our consultants have also supported a number of Stark self-disclosure audits to assist hospital management and counsel in conducting internal investigations and preparing reports to government authorities. Make sure your payer contracts support your business and financial goals. Pinnacle Healthcare Consulting will profile your clinical activities and ensure proper coding to establish equitable contract terms and management systems. It’s a crucial part of bottom line success. Master the key operational, financial and strategic systems needed for physician practice success. Pinnacle Healthcare Consulting works for hospital and physician practice managers. We evaluate processes and performance against industry best practices and recommend business-building improvements. Effective billing/coding practices mean more than optimized revenue. They can mean the difference between compliance and fraud. Pinnacle owns and operates a medical billing company with certified coders on staff that can be tapped to evaluate your revenue cycle management program. Our deep experience and expertise can help you enhance both revenue and compliance. The rapidly changing healthcare environment is again pushing hospitals and physicians to streamline care delivery methods. Pinnacle helps devise strategies and operational solutions to create high performing, integrated organizations. Importantly, we have the ability to partner with health systems to create and manage the necessary infrastructure to successfully operate integrated practices. A successful healthcare business needs clear, detailed strategies and a deep knowledge of your specific business environment. We help hospitals and physician practices develop innovative and sound solutions that improve performance and business development. Pinnacle Healthcare Consulting brings a balanced perspective to business valuation, needs assessments, and feasibility in all financial transactions involving physician practices or ancillary clinics. We have extensive experience in dialysis clinics but can offer our real-world expertise to anyone looking to add physicians, acquire practices, create unique professional service arrangements and more. Launching a group is a complex process but one we’ve completed many times. Our proven project management plan helps create or integrate individual practices, form a smaller group from a larger one, or add physicians to hospital integration initiatives. Plus, once we’ve helped create your group, we can provide on-going practice management services to get your doors open as quickly as possible. Pinnacle Healthcare Consulting partners currently sit on the board or advisory panels of several healthcare associations and have worked internally at some leading organizations. If your association needs experienced guidance on membership, management, or strategic issues, we can help with project engagements, executive retreats, industry research and more. We can help physicians and staff better understand the business of healthcare. In fact, we regularly teach residents at hospitals, demonstrating effective management techniques for running successful practices. If you have new hires, position them to succeed with our training programs. 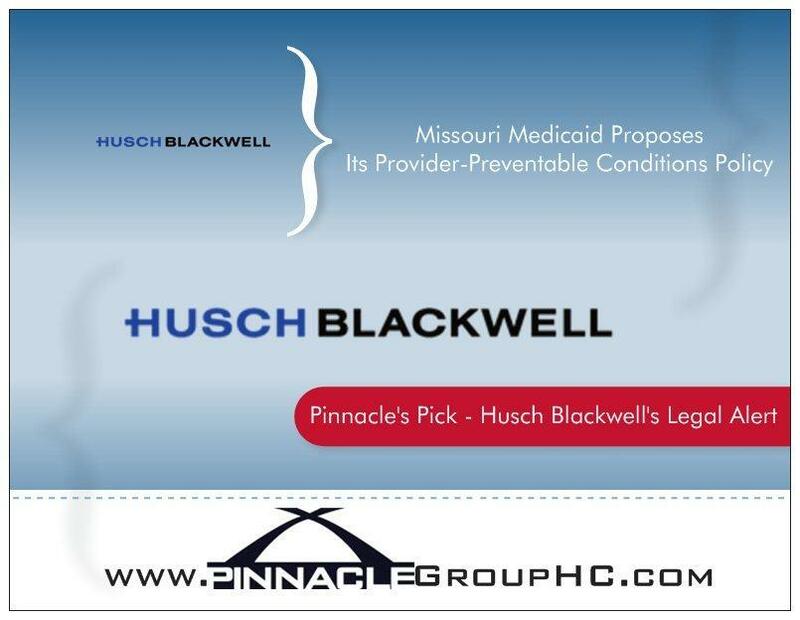 Missouri’s Medicaid agency is proposing to expand the current payment prohibition to include healthcare acquired conditions as defined by Medicare and to require hospitals and ambulatory surgical centers to bill for provider-preventable conditions as the method for reporting such incidents to the state. Providers have 30 days from January 3, 2012, to file comments on the proposed rule.